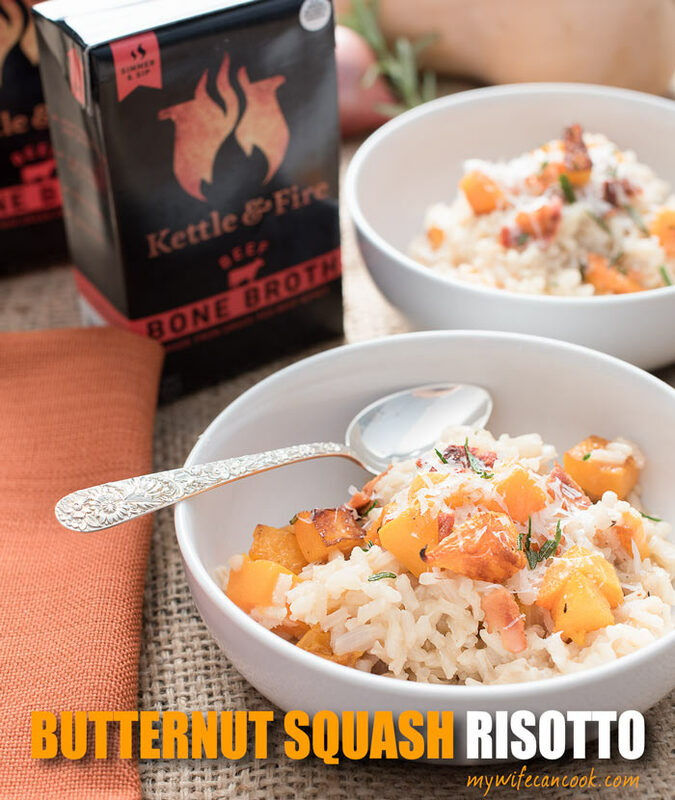 Butternut Squash Beef Broth Risotto - Easier than you think! Today we are cooking up some butternut squash beef broth risotto. 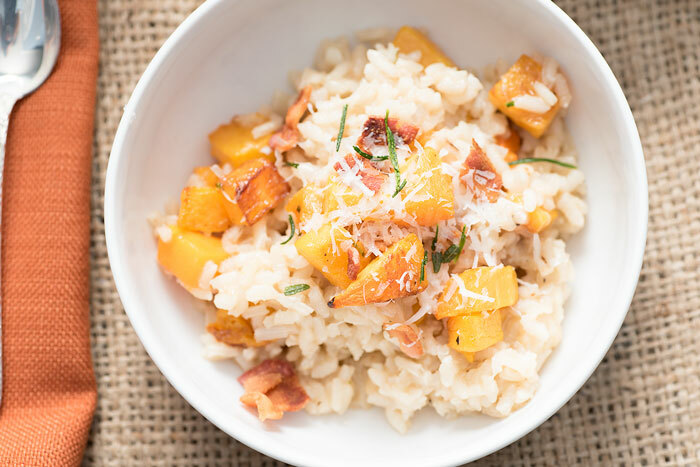 We’ve been wanting to do a risotto for a while and this risotto features old and new favorite ingredients, roasted butternut squash and beef broth. 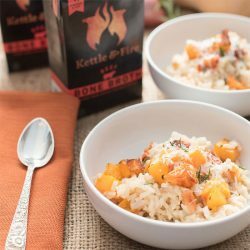 Disclaimer: This post contains affiliate links (	Affiliate Note	) and we received free products from Kettle and Fire, but all opinions expressed within this post are our own. We are all about butternut squash. We’ve posted two butternut soup recipes recently that are both staples for us this time of year: our Thai butternut squash soup and our vegan butternut squash soup. Another of our favorite butternut squash recipes is a cheesy provolone pasta topped with roasted butternut squash, shallots, and bacon. Uh, yum! It is really amazing but does require roasting the squash, cooking the pasta, making a cheese sauce, mixing it together, cooking bacon and shallots, and then assembling and baking for additional time. Not gonna lie, the kitchen is a disaster after that and all total it will probably be a couple hours before you eat. Pots, pans, cheese, etc. all over the place. Worth doing on some special occasions, but now that we have kids it’s not always feasible. So, we decided to try the same flavors in a little more week-night-friendly dish, a Butternut Squash Risotto with beef brone broth. We’re really excited about this recipe and think it’s a great one to add to your family menu, especially if you meal prep on the weekend and already have roasted butternut squash in the fridge. Check out this quick video on making butternut squash beef broth risotto. Risotto is one of those dishes that seems a little daunting. Especially if you ever watch Hell’s Kitchen. I feel like anytime I watched that show, Chef Ramsay was always screaming at someone because their risotto was still crunchy. And then he would slam it into the trash and call the person a donkey! Not a kitchen I want to work in, but fun to watch. Anyway, when someone is not yelling at you and calling you names, risotto is not that difficult. I think the key to risotto is to get it to the right heat and just keep adding broth (heated broth, not cold) and stirring. The other key is to use a good broth. 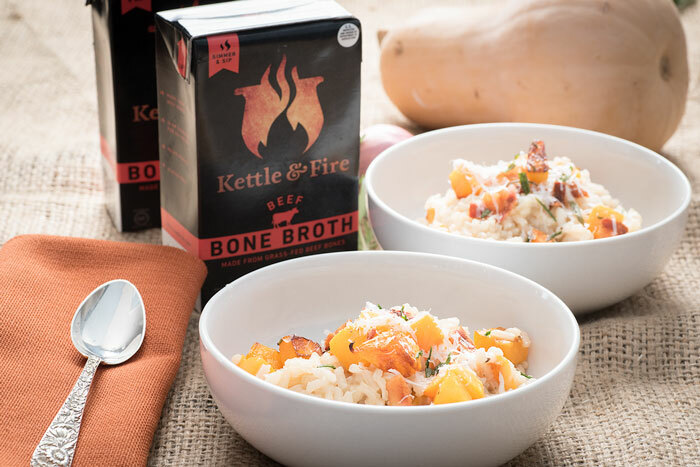 The broth we used in this recipe was beef bone broth from Kettle and Fire. Now, if you’ve read this blog before you may know that I (Melissa) suffer from the alpha-gal allergy (yes, it’s a real thing) and so I have to steer clear of meat products unless I want a severe stomach ache. Apparently, sometimes the allergy can fade over time so maybe there’s a chance that someday I can be released from this baconless hell in which I know reside (joking, but not joking). So, we did make 2 batches of this: one without the bone broth or bacon for me and the other with the beef bone broth and the bacon with my husband Greg said was great. Mine was good as well, but I did look longingly at his bowl. But, it’s important for so many of us who suffer from food allergies to remember that there are always great alternatives and great food we can still enjoy. 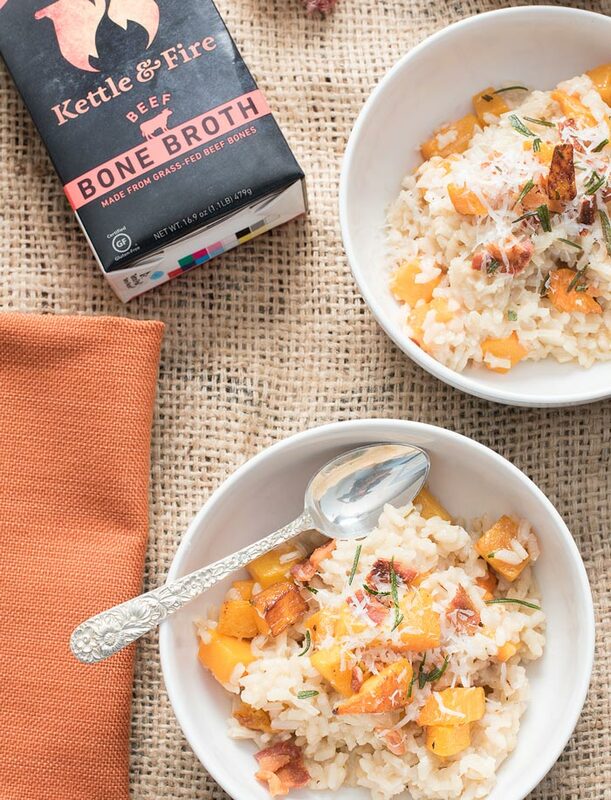 Bone broth makes a great addition to a risotto not only because of the rich flavor (so my husband tells me), but also because of it’s known health benefits. Dr. Axe talks about the many bone broth benefits including treatment of leaky gut syndrome, improved joint health, and a bolstered immune system. It is also supposed to be good for overcoming food allergies…hmmm…I don’t know all the details about this benefit, but it sounds like something I should investigate further! So this one was a little tough for me as it’s hard to endure the smell of bacon when I can no longer enjoy it, but at the end of the day risotto of any sort still makes me happy. 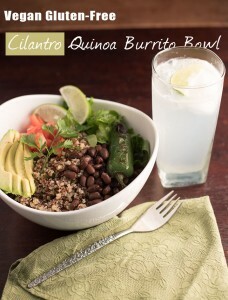 And it does sometimes force me to eat a little healthier. We have an asparagus risotto that is amazing and have even made it slightly more healthy by making a vegan quinoa asparagus version. I think the good thing about risotto is that you can really customize it to the vegetable in season. And then add whatever suits you at the end–crispy or fresh herbs, a little lemon zest, some sort of cheese and butter, etc. 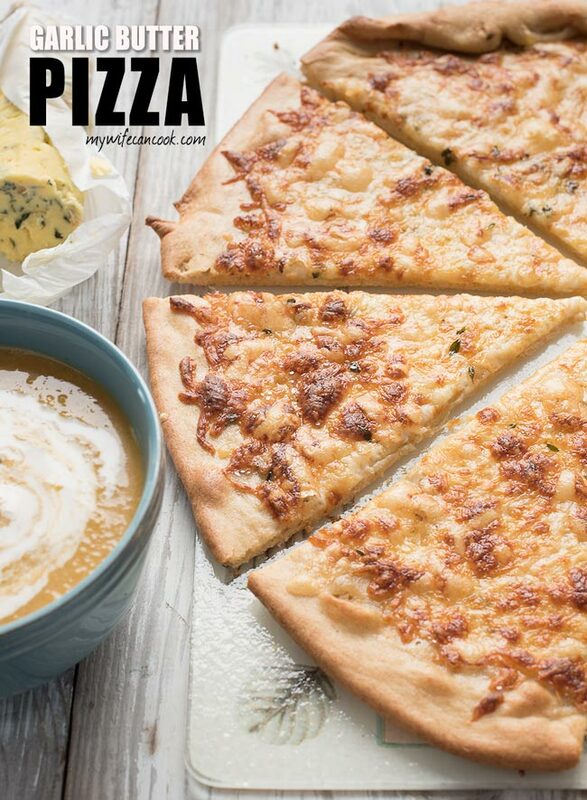 The butter and a little cheese really makes it creamy! Heat broth and water in a small pan until simmering, and turn off heat. Once oil is hot, place rosemary sprigs in the pan and cook for 2-3 minutes, turning over once. Once rosemary has started to brown, remove from pan and let cool on paper towels. Add shallots and garlic to pan and cook and stir for 1-2 minutes. Add rice, stir, and cook for 2 minutes. Add 1/2 c. broth and cook until dissolved. Turn heat down to a simmer and add broth a 1/2 c. at a time every 3-5 minutes and stir. Once rice is cooked (takes about 25 minutes), add butter, cheese, roasted butternut squash, and some of the rosemary, crushed up. Serve garnished with additional grated parmesan, crushed up rosemary, and bacon. Seriously I can eat risotto all by itself. This sounds delicious. What a great way to use squash in a dish. It goes quick here. So good! Yum! I’m addicted to risotto! Yes, it is perfect comfort food. Thanks! I LOVE that you used beef broth in this risotto. It’s highly underused in my opinion and I bet it delivers some great flavour profiles (e.g.. saltier, more punch, etc.) to this dish. Thanks! Yes, it is definitely underused! I love squash. This looks great! 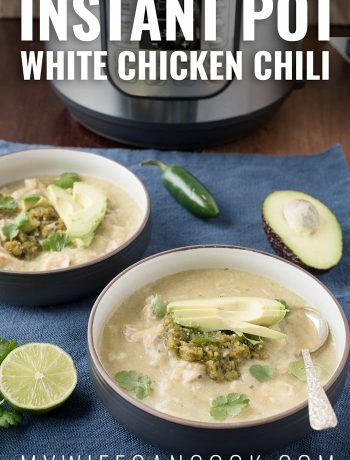 This looks like a perfect fall recipe! Yum, I love all the flavors you have going on here!